...an inordinate fondness for beetles. Observation - ...an inordinate fondness for beetles. - UK and Ireland. 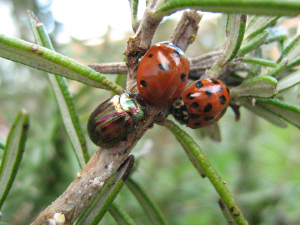 Description: after the cold winter, the rosemary beetles are back. This one, in the company of a seven spot and a harlequin ladybird. after the cold winter, the rosemary beetles are back. This one, in the company of a seven spot and a harlequin ladybird.